Solar Path believes investing in solar photovoltaic (PV) solar panels is a smart investment. According to a BusinessWeek article, customers can expect a rate of return of 15% or more per year. Customers can save upwards of $45,000.00 over the lifetime of you solar system, based on a home in Tucson, Arizona with an average of a $187 per month electric bill. Federal law allows for a 30% tax credit for solar energy system installations. That means that you can claim a tax credit on your tax return for 30% of the total cost of your system! See details at energy.gov. Homeowners can claim a 25% tax credit up to $1,000 for solar devices installed on a residence. This is a one time tax credit and restricts the homeowner for additional credits for solar purchases made for the same residence in subsequent years. See details at the Arizona Solar Center. • Department of Energy, Tax Credits, Rebates & Savings Tax. A matrix for residential, commercial, and non-profit options. • Database of State Incentives for Renewable Efficiency. A one-stop website listing State and Federal Solar energy incentives. Our Southern Arizona electricity utilities, including Tucson Electric Power (TEP), Trico, Sulphur Springs Valley Electric (SSVEC), and Arizona Public Service (APS), offer incentives via their Solar Electric Photovoltaic residential and commercial programs. If your utility provider isn’t listed, contact us or your local utility to find out the latest incentives offered. Part of the Solar Path team are LEED Accredited Professionals (Leadership in Energy and Environmental Design). What this means for our clients is that they can be confident that we understand the importance of being environmentally responsible in design and construction. Our team is committed to the promotion and implementation of sustainable practices in all areas of business. For more information of being LEED accredited, visit US Green Building Council. Solar Path designs each system to suit the specific needs and usage of each owner. Our staff is trained to engineer the system for optimal efficiency with a focus on obtaining the shortest possible payback period and best return on investment. We offer a free energy analysis that will include the photovoltaic (PV) (solar energy) system design, available utility rebates, and tax incentives. Call today for your free energy analysis. The environmental benefits of harnessing the sun's power to power our homes and businesses are plentiful. Both major utilities in Southern Arizona create electricity by burning coal mined in Arizona. By choosing to go solar, system owners can reduce the amount of coal needed to power their lifestyles. Going solar can reduce your carbon footprint, (the amount of carbon needed to power your lifestyle) by reducing the amount of coal that is burned and thereby reducing the carbon dioxide that is released into our atmosphere. Solar Path will help your commercial business qualify for the maximum benefits and incentives. 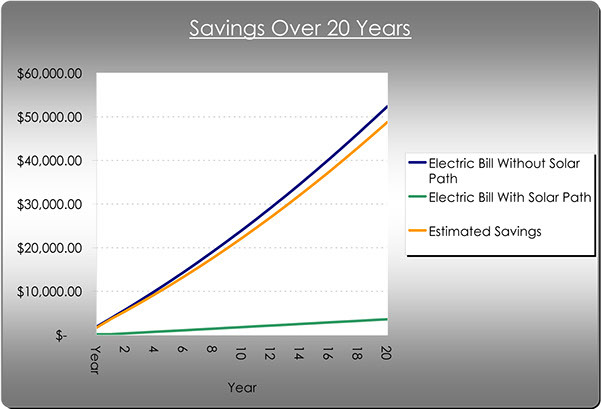 Be amazed at how much you can save with our residential solar panels.